1st Skill, Ablility, and/or Weapon: Spade Grab. Beat grabs an enemy and uses him/her as a shield for 1 turn. 40 SP. 2nd Skill, Ability, and/or Weapon: Clover Flip. Beat flips with his board to damage the enemy. 25 Damage. 35 SP. 3rd Skill, Ability, and/or Weapon: Heart Smash. Beat jumps with his board into the air and smashes into the enemy. 40 Damage. 50 SP. 5th Skill, Ability, and/or Weapon: Chain Slide. Neku and Beat summon chains to surround the enemies. The they both get on their boards and dash along the chains to damage the enemies. 30 Damage to all. 50 SP. At the end of the 1st week, Beat joins the Reapers. This is a result of Rhyme's death from a Noise Trap, which Beat should have fallen into. Rhyme is erased by that same Noise, echoing Beat and Rhyme's death from the previous car accident. Mr. Hanekoma replaces Rhyme with a pin made from Rhyme's data, which Beat partners with. However, Beat is unable to use it in battle, and so approaches the Reapers in order to use its power. This leads him to becoming a Reaper, and is assigned to defeat Neku and Joshua during the 2nd week. As a Reaper, Beats costume does not change but he does grow the traditional skeletal wings that all reapers possess. During the 3rd week, Neku's entry fee was the necessity of other players, which meant that he would be quickly erased (being that a player without a partner cannot erase Noise). 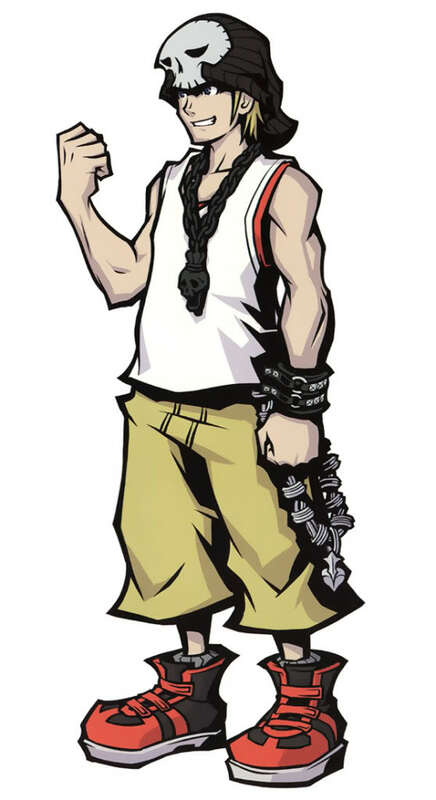 Feeling that this was a cheap rule to add to the game, Beat renounces his Reaper status and forms a pact with Neku. However, Beat learns that during his time as a Reaper, he earned zero points and he will die in roughly six days, as a Reaper's life span is based on the number of Players they erase. Beat decides to become the new Composer, in order to return Rhyme and his friends to life and to rectify the trouble he caused as a Reaper. Before he entered the Reapers' Game, he was much like Neku, uncaring and pushing away his sister from him. With the discovery that Rhyme has lost her memories, he lies that his dream was to become the best skateboarder in the world, as truly he has no dreams. At the end of the game, he is seen meeting Neku in front of the Hachiko, with Rhyme by his side. His entry fee for the 1st week were Rhyme's memories of him, and in the 3rd week, it was Rhyme's Noise pin.